Every year, the National Association of Home Builders and the National Kitchen and Bath Association team up to bring industry professionals, like our company, a top-notch tradeshow. Over 100,000 builders, remodelers and design professionals from across the global come together for a three-day event, Design and Construction Week™ new products are available to see, and we can learn about what’s trending in home design. One education session that is always popular is “60 Design Ideas in 60 Minutes,” and from this session, we’ve created our top 13 design trends for kitchens and bathrooms – as suggested by some of the top industry pros. Kitchens have a new meaning in our lives. 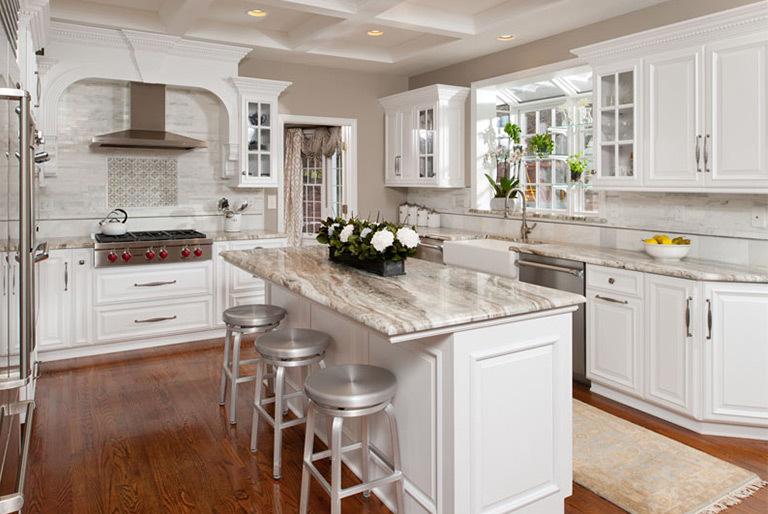 People continue to want to stay connected to their friends and family and use the kitchen space in that fashion. Today’s kitchen trends are about convenience and functionality. 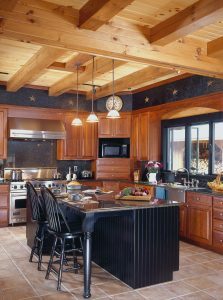 Timberhaven kitchen interior, featuring a participation island. Participation Island: Islands are getting bigger – much bigger. Kitchen islands need to be able to handle multiple functions at the same time, such as two chefs preparing food while still having space for friends to congregate. The Morning Kitchen: This is a separate space in the kitchen where you tuck the breakfast-prep items, such as the coffee maker, smoothie machine and toaster. It can also accommodate shelves and the microwave drawer, so children can get their own breakfast in the morning. Dining Rooms & Breakfast Nooks: People are forgoing traditional dining rooms to dedicate that square footage for home offices, dens or playrooms. As a result, they are creating more seating space around the island and larger breakfast nooks. Storage: There can never be enough of it, and kitchen cabinetry is becoming quite versatile with storage options. From pull-out corner trays and spice rack drawers to pull-down racks and kick drawers, there truly is no limit to how organized and functional a kitchen can be. Collector Cabinets: Free-standing curio cabinets are in the past, and lighted, built-in collector cabinets are in. This is the perfect spot to display family collectibles and beautiful glass pieces and heirlooms. Beverage Center: This separate area dedicated to beverages features a small second refrigerator where both alcoholic and non-alcoholic beverages, like sparkling water, are stored. This is the perfect spot for friends to grab a cold drink without disrupting the chef’s meal preparation. Natural Elements: Natural elements, like stone, brick and wood, are being tastefully designed into all of the spaces of the house, including the kitchen. Pantries: No longer a second-thought closet, the pantry has been upgraded to one of the main features of the kitchen – with plenty of storage, counterspace and light. Technology: Technology is playing an even bigger role in the kitchen. Wireless speakers, charging hubs, smart appliances and voice-activated assistants are all becoming a requested feature in our kitchens. 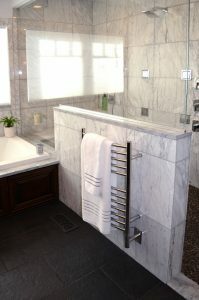 The bathroom, particularly the Master Bath, remains one of the most requested renovations today. Today’s bathrooms are still about designing a clean, fresh oasis for homeowners to find a bit of comfort and tranquility in their lives. Showers & Tubs: Beautiful, tiled walk-in or seamless glass showers are still a must-have, and they are getting bigger – meaning more square footage is dedicated to showers. Roomy soaking tubs remain a hot trend with no signs of changing anytime soon. Lighting: Lighting options continue to abound in the bathroom – chandeliers, sconces and even back-lit mirrors are all being added to this space. Aging in Place Gracefully: A concern for many is aging – either being able to stay in your home longer or taking care of an older relative within your home. As such, a whole new era of accessibility features, such as decorative grab-bars, have come into vogue. Wood Vanities: More homeowners are opting for wood vanities – which often mimic a freestanding piece of furniture. They bring the outdoor elements into the home, and give the bathroom a clean, natural look. The “buzz word” at this year’s tradeshow was flexibility. Creating flexible spaces – either temporarily or long term – within our homes. Many of the design ideas we’ve shared with you can be modified down the road, should that be what you need or want. As your design-build professional, we want to create flexible spaces that you can enjoy for years to come. Contact us to talk further! Photos used in this article are from our homes.